I was sent this yesterday: http://www.youtube.com/watch?v=VXVdNKciP94&e which got me thinking about the blues band we wanted to form when we're older covering heavy metal classics from our youth. My friend Pete wants to play the banjo and I thought a ukulele would go well with that. Then Swellbow told me about the Flying V Ukulele.... Now all we need is a name. Answers on a comment-shaped postcard please. 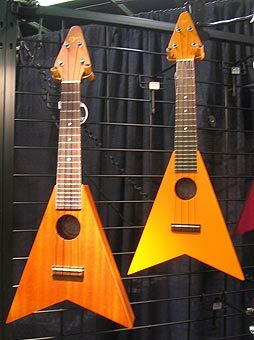 I so badly want a Flying V ukelele.